You’ve met Christopher West here before, but this time it’s for a project all GMs (and many others) will find interesting: a huge set of castle maps perfect for a home base or a villain’s lair. I’ve backed many of Chris’s previous Kickstarters, and not only because he made such beautiful maps for me back in the days of Star Wars Gamer. They’re great both for illuminating an existing setting and for inspiring a new scenario that you design yourself. Here’s our brief chat about the Halls of Legend. As a GM, how do you use maps (and miniatures) to create an adventure? Both as a GM and as a mapmaker, I seek to create encounter locations that will be both memorable and exciting. With that in mind, I will often put together a story arc for my games designed to include specific environments that I’ve already mapped—and I will map specific environments that will support that sort of storytelling. There’s a synergy between the two activities that serves me well. In essence, I plot my encounters around a cool location for which I have an interesting map, and then give my villains a reason to be there that grounds the story in that location. You’re famous for SF and fantasy maps. What sorts of maps would you create for horror scenarios? That depends a lot on the type of horror, honestly. For monster-themed horror, I like to take modern heroes out of their environment and drop them in lairs, either in natural or otherworldly—but far from help, in either case. My Forsaken Lands maps are mean to work for that sort of environment. But for more of an urban nightmare type horror, you can’t beat dark alleyways, slimy sewers, abandoned warehouses, condemned tenement buildings, or a nice slaughterhouse converted into a cultist hideout. Some gamers hate the 5-foot-square grid, while others (like me) love it. What would you say to the naysayers to persuade them to try the grid? That’s some treacherous ground on which to plant a flag! Both camps have valid arguments to make, so I try to stay as neutral as possible and invite both sides to meet me in the middle. I do include a 1-inch (5-foot) grid in nearly all of my poster maps, because there are a lot of tactical game systems which you can’t really play without it—but at the same time, I work to keep that grid as natural and unobtrusive as possible, preferring a subtle grid over one that distracts you from the environment. That way the players that want a grid can find it, and the players that don’t want a grid can ignore it. But, to answer your question: I like using a grid because it can help to sidestep arguments that sometimes arise about cover, concealment, and line of sight during an encounter. If there’s a grid on the map and the objects showing on the map can clearly delineate the positions of walls and cover around your characters, it gives everyone a shared reference point and makes a lot of those arguments unnecessary. Other gamers eschew maps and minis altogether, preferring “theater of the mind.” What do you feel maps & minis can add to the game? I’ve run and played in satisfying games that eschew maps and minis, but I really do prefer to use them whenever possible—especially (but not exclusively) during action scenes. If a map has these details, it can add a richness to your storytelling that enhances your game-play and inspires the players to use the scenery instead of just making dice roll after dice roll until the opponents run out of hit points. In my experience, games with maps and minis become much more cinematic experiences instead of a number-crunching exercise, and I just love that. What’s the best moment from one of your own games that involved a map? One of my favorite stories about maps and minis involves a Star Wars adventure I ran. The players were driving a cargo transport—a floating truck—through a canyon in the Jundland Wastes, when an act of sabotage dropped the truck to the ground and set up what would become a double-ambush encounter with both marauding pirates and opportunistic tusken raiders, on a canyon ledge with a sharp ravine on their left and a tall cliff wall on their right. But first the player characters needed to unload the truck so they could try to repair it—which meant that when they were attacked, they had crates of various sizes scattered on the ground around the truck. The map in this encounter was hand-drawn, but the truck and the cargo crates were represented with my Sci-Fi Cargo Tiles as individual cut-out pieces on top of the map. The players had their own miniatures for their characters, and I had miniatures for the pirates, their speeder bikes and skiff, their E-Web cannon, and the sandpeople and banthas who crashed the party. It was a big, busy map with all kinds of cover and a lot of moving pieces by the end. What made it memorable, though, was that all of those pieces of cut-out terrain changed the game in ways I couldn’t have predicted. The player characters climbed on top of them, and hid behind them, but they also moved them around, strategically. As they defeated several pirates, their crashing speeder bikes changed the battlefield dramatically, blasting crates across the map and smashing open one massive container with warning labels—which unleashed a hungry nexu creature that joined the fray and started eating people. It was one of the most exciting combat scenes any of us had ever been involved in, and it culminated with a crazed bantha bull-rushing the party’s vehicle right over the cliff’s edge—which gave the party’s young Jedi a chance to shine, saving the truck and levitating it back to them with a timely and amazing critical success on her Force power check. All of these twists and turns were made possible because all of these extra map features were physical objects on top of the map that the players and I could personally manipulate, and that real-world ability to move them around inspired us to do exactly that, narratively within the story. If everything had been drawn in place, the action wouldn’t have been nearly so dynamic. Be sure to check out Chris’s latest Kickstarter. It’s that Marc Tassin again, tireless organizer of the Writers Symposium at Gen Con and tireless creator of his own fantasy setting. He’s launched a third Kickstarter campaign after two successful antecedents. This time it’s not just an adventure or a story collection—it’s a whole world. After the success of his Temple of Modren Pathfinder adventure and his Champions of Aetaltis anthology, Marc’s going full Greenwood by presenting an entire fantasy campaign setting for 5th edition Dungeons and Dragons. Fortunately for his sanity, Marc has a team of talented collaborators in the form of Mechanical Muse. They’re hard at work spreading the word about this new project while simultaneously shepherding the massive project. Marc’s right in the thick of it, so let’s test just how tireless he is by throwing him a few impertinent questions. I get the feeling this setting harks back to an era of heroic and epic fantasy that I felt was at its height in the 80s. Does that seem right? On the surface, I can see it appearing that way. With Aetaltis I’ve definitely worked to create a new world that strikes many of the same chords in readers and players that you’d expect from a classic heroic fantasy setting like Faerûn, Oerth, or Krynn. The key, however, is that Aetaltis isn’t an homage or an attempt to copy the legendary settings of that era. Rather, I’m building a completely new world that draws on the same root sources and ideas that inspired the creators of those settings. The end goal is to create a brand new world that can stand alongside those settings rather than a world that harks back to them. A tall order, I know, but that’s what I’m working to do. I’m just not convinced we’re done exploring worlds like these. There are still stories to tell and wonders to reveal! What are the challenges in making the players of a game feel like epic heroes? For me, the “epic” in Epic Fantasy™ really refers to the impact that the character’s actions have on the history and the world. I think of it like this: if someone was writing a history book about the world, would the events surrounding the characters’ adventure warrant its own chapter? If the answer is “yes,” then we’re talking about epic fantasy. With that as the definition, the specific obstacles the heroes need to overcome become less important. Could there be a giant large-scale set-piece battle with gathered armies facing off in a final fight? Sure! But if the real events on which everything turns are a couple of tiny heroes sneaking up to a volcano to throw a cursed magic item into it, that massive battle is an exciting bit of background, but not fundamental to the epic nature of what the heroes are attempting to achieve. One thing I don’t agree with is that heroic and epic go hand in hand. What makes an adventure epic is the scale of the consequence of failure. What makes an adventure heroic is why the heroes are undertaking the task in the first place. Aetaltis is more about the why than the what. For me, the tale of a shepherd who takes up arms to defend his village against a small goblin hunting party simply because it’s the right thing to do, is every bit as compelling to me as the knight that rides into hell to destroy the demon that threatens the world. Of all the iconic locations in the setting, which one would you say is most original to Aetaltis? The Newardine Cels are definitely something different from what players have seen in the past. The newardin are one of the races unique to Aetaltis. They are a strange, otherworldly people that are cut from a very different cloth than the other races of the world. They originally came to Aetaltis as off-world colonists, members of a group called the Atlan Alliance. In this alliance of different races, which included the humans, the newardins’ role was to operate the magical gates that the Alliance used to travel between worlds. When the gates cataclysmically collapsed just over three hundred years ago, however, the surviving members of the Alliance were trapped on Aetaltis. The newardin did not adapt well to life on Aetaltis. They congregated in cities where they constructed tightly controlled compounds that reflected the architecture, culture, and ideals of their homeland. Strange spiraling towers, impossibly thin pillars made out of materials unknown to the rest of Aetaltis’ inhabitants, and unfathomable cultural norms make these cels a slice of another world thrust into the otherwise familiar surroundings of Aetaltis’ other environments. In the background of the Kickstarter video, you can catch a glimpse of one of these structures. What’s the perfect relationship between fiction and the canonical events of an RPG? I think you can place equal emphasis on both. Since we have strong support from both gamers and non-gamers alike, there’s no reason we can’t continue to provide more than one path to Aetaltis. And that’s important to me. Our goal isn’t to create games or write books. Our goal is to create an amazing world that people want to be a part of and then deliver tools they can use to interact with it. Games, books, comics, apps: in the end they’re all just different portals through which someone can visit a world. You’re producing a Player’s Guide, a Game Master’s Guide, and an Adventurer’s Guide—but conspicuously not a book of monsters. Is that because you want to change the paradigm of play? Also, what makes your Game Master’s Guide stand apart from others recently published? The reason our first monster book is a stretch goal rather than a core book is that what’s important in Aetaltis is the origin of monster, the story behind it, rather than the monster’s stats. This is information we can convey in the three core books without stat blocks. If you understand these origins, you can pull monsters from any of the bestiaries already available fifth edition and fit them easily into the story of Aetaltis. Don’t get me wrong, we love monsters, especially the wonderfully quirky creatures born out of roleplaying games over the years (owlbears anyone?) And we certainly have plenty of unique creatures we’re excited to share. That’s why the monster book is the next one we want to publish after the core books. It’s just not a requirement to experience the world. As for the game master’s guide, the key here is that our guide is designed specifically to help game masters run adventures set in Aetaltis. Whether it’s advice on where in the world to base a campaign that captures your groups preferred style of play or guidelines for introducing your favorite non-Aetaltan character race to the game, our game master’s guide is the key to doing that. This is information you can’t get from other guides. What are ten things that make Aetaltis stand out from other settings. Magic, originally a gift from the fallen god Endroren, is as frightening as it is useful. Endroren is chained to the core of the world, desperate to break free and return to the surface. The dwarves hate the gods for using their home, the Deeplands, as a prison for Endroren and his minions. Goblins, trolls, orcs, and many traditional fantasy monsters have only just returned to the world after the wards that trapped them in the Deeplands began to fail. Adventuring is a respectable occupation thanks to the edicts of Lord Drakewyn of New Erinor. Humans are not originally from Aetaltis but are travelers from another world trapped there when the gates to their homeland catastrophically failed. When the gates collapsed, they drew all manner of creatures, landscapes, and beings into the world. Essence wells, ley lines, essence crystals, and blood magic mean that there is far more to Aetaltan spellcasting than simple spell memorization. The temptation and ease of entreating Endroren for aid means that every hero must struggle to stay on the path of light. Join the World of Aetaltis Kickstarter, follow the project on Facebook, or keep up at the website. Dave Barrett’s It’s All Fun and Games is the first in a series of Young Adult novels from the Nerdist’s new imprint through Inkshares. It features the teenage players of a Live Action Role Playing (LARP) game who find themselves transported to an actual, factual fantasy world. We’ve seen that trick before, but Barrett breathes new life into the conceit. I imagine hordes of young readers discovering LARPs the way so many of my generation got turned on to tabletop RPGs after reading the late Joel Rosenberg’s Guardians of the Flame novels. I had the pleasure of reading an advance copy of Dave’s debut, and he kindly agreed to answer a few of my geeky questions. Please tell us about your earliest experiences with tabletop RPGs and LARPs. My older brother, Jim, brought home AD&D from high school in 1981. My first character was a ranger named Fred (I was 8). I remember playing White Plume Mountain and the Against the Giants series as solo adventures—it was just poor Fred. Considering the modules were made for full parties, my brother must have pulled a lot of punches to get me through them. Later during elementary school, it was the Sword of Damocles hanging over my head for math tests. Anything less than a 90, and no D&D for the rest of the week. I did really well in Math that year. I still try to play whenever I can. I’m mostly playing Pathfinder now. My LARP experience is a different matter. It didn’t even occur to me it was possible until I got closer to college and learned about groups like NERO. The lack of internet made discovering these things really difficult! During college and just after I attended a couple events I had been invited to by friends and had a great time, though with busy life and young kids, it’s not always easy to find time for RPGs, particularly ones that stretch over full days. I’ve attended Intercon in Massachusetts, and had a lot of fun. Chance in the form of dice rolls plays a big part in games. Wandering monsters, after all! How do you create a sense of randomness in a story without allowing it to feel like a cheat? It’s funny you should ask, because I actually bring this up in It’s All Fun and Games. Playing D&D in the RPGA (and other orgs), I’ve gotten used to the idea of Obligatory Thug Attack, or OTA—a combat encounter designed mostly to sap the party of some of their resources so that when they fight the final boss they’re not at full strength. So I actually included that in the story—before the kids cross over into the game world they get jumped by some random monsters, and someone explains the OTA to Allison. Once they cross over, though, that’s a different thing. If a scene isn’t advancing plot or character, or providing some sort of backstory, I personally don’t want to read about it. Because I wanted to write the kind of book I like to read, things move pretty directly toward the climax. I’m not writing a module, I’m writing a novel. Why do you think interest in LARPs has grown so much in the past few decades? I think this is a function of two things. First, mainstream culture has embraced geekdom wholeheartedly in the last several decades. Between the Lord of the Rings movies and the Marvel Cinematic Universe on the Big Screen, the huge successes of webseries like The Guild and LARPs, and of course The Big Bang Theory and World of Warcraft, it’s become OK to get dressed up as your favorite character and go to a convention. For instance, SDCC sells out of passes within minutes each year! Second, it’s so much easier to find like-minded individuals nowadays. Growing up in Houston, I was able to find our local SCA folks (they were in the Yellow Pages! ), but if anyone was LARPing down there, I didn’t know about it. Today, if you’re interested in giving it a try, it’s just a couple clicks away to find a group that’s playing the sort of game you want to get into. How do you find playing RPGs complements your writing? Playing RPGs expands your imagination, and without imagination, there’s no writing. I’ve played characters from sneaky rogues to flamboyant pirates to an elderly grandmother who could knit as well as she could cast the evil eye. Getting into a character and interacting with the others in your group—taking what they bring and building on it—is a great way to experience others’ personalities. Personalities that you could then turn into characters! On the other side, the RPG view does run the risk of making your foils one-dimensional. Players think of elaborate backstories that brought their character to this point in time and spend hours roleplaying with one another. Then, in six rounds of combat they run ramshackle over the baddie and his henchmen, loot the bodies, and move on. Those baddies must have had just as complex reasons for doing what they did, but because they only exist as a speed bump in the overall campaign, we never really think much about that. For a Young Adult book, where do you draw the line on violence? How about sexuality? Sexuality, I just punted. It’s All Fun and Games isn’t a romance novel (or even a fantasy romance novel). I left myself a little wiggle room if I really wanted to head down that route with sequels, but I’m pretty sure it’s the last thing on their minds right now. Only one of the characters is even old enough to drive, so even if I decide to pair off any of the characters, it’s going to be pretty tame. If readers want a novel that explores teenage sexuality, there are plenty of choices on the market. Check out It’s All Fun and Games at Inkshares (or on Amazon) and keep an eye on the latest news on Facebook. For your bonus action, follow Dave Barrett on Twitter. Mike Myler and I have a few friends in common, but I had no idea how much our tastes overlap until we chatted about Mists of Akuma. Film noir? Check. Asian fantasy? Check. Steampunk? Well, we both like that a little, so let’s call that 3/3. Yours is not the first Eastern Fantasy/Steampunk mashup I’ve noticed. Why do those genres go together so well? I think that there’s a mystique inherent to both—a sense of the unknown and unexpected that pairs nicely. Also there’s a sort of ramshackle quality both genres can have which resonates when the two interact. The order of descriptors for Mists of Akuma is intentional: eastern fantasy first, noir second, and steampunk third. It’s an eastern world with dark overtones, and there happens to be steampunk in it, but it’s not an overwhelming presence. I’m a Warhammer 40k junkie, and I adore the relationship that universe has with technology and heresy, so here we’ve combined them. In Mists of Akuma, one of the major elements of the setting are tsukumogami, objects that transform into creatures on their 100th birthday. Because most technology is from afar or antiquated, it inspires fear because that rifle you’ve got might wake up and try to kill you! Why add noir to the mix? And what do you mean by “noir”? I’m an early graduate from the University of Pittsburgh with a major in Film Studies, so my go-to answer on what qualifies as noir comes from a seminal article on the subject by Paul Schrader in 1971: Notes on Film Noir. You can read the whole bit here, though this link is to the specific part I’m referencing). The thing to understand about noir is that it was a genre of film borne from circumstance. If you check out Schrader’s article, you’ll find several different stylistic things that tie all films noir, no matter how disparate, to the genre—scenes largely lit for night, a Freudian fear of water, oblique lines in the mise-en-scène. Think about Westerns with their big, wide horizontal landscapes and compare that to films noir—lots of vertical blinds, disruptive vertical shadows, and the like. These are the results of budgetary restraints and production realities, but most of the directors behind these movies (notably Fritz Lang and Billy Wilder) had fled from the rise of Nazism and were masters of German Expressionism. The lack of lighting that creates the dark ambiance of a film noir has to do with energy limits; there are stories of lighting techs breaking down into tears because their producers came down on them so hard. These are all reflective of the US wartime economy and the stylistic choices forced on those movies. Why is Mists of Akuma a noir setting? The world is predicated for you to lose against a constant battle to retain your virtue. I had a hankering for a dark setting, not something borne out of old school horror but of desperation. The antiheroic roles of noir protagonists was a perfect fit, doubly so because corruption is a major part of the world. It became clear that noir was a term that fits what we want GMs and players to expect when they sit down for a game in Soburin. Victories are few, Pyrrhic, and usually involve a great deal of sacrifice. RPG adventures come in many forms, from location-based exploration to plot-driven investigations and other variations. What sorts of adventures work best in the Mists of Akuma setting? City-based adventures have proven the best so far, but we’re building the setting in such a way that quests will be easy to come by. To fight the demon-spewing Mists of Akuma that roil over Soburin, the Masuto Imperial Family has decreed that each of the 23 clans have “bengoshi,” functionaries able to deputize people to help keep order. There’s an obvious love for investigations, and GMs will find the detailed entries we’re focusing on very useful for those purposes. Our first stretch goal is for the DM of my youth to write an adventure to be included in the book: Will of the Palemaster, a module that takes place in a fort during a festival when the Mists of Akuma suddenly appear! People who already love Eastern Fantasy are probably already sold on Mists of Akuma, but how do you tempt those who’re used to “classic” (European) fantasy? I’d point out that this is not a steampunk world—it is a world with steampunk in it—and that Eastern Fantasy is the first descriptor because that’s what the primary focus of Mists of Akuma is. You can still get a lot of excellent use out of the samurai sacred oath, tsukumogami hunter, imperial dragons, oni monsters, 23 distinctive clans, eastern weapons, martial arts stance feats, more than two dozen new race options, character backgrounds, and more. Those who check out the free preview PDFs will find that there’s no shortage of material they can mine for a more traditional game. It’s also not hard to imagine Soburin before foreign technology arrived, so removing the influence of technology altogether won’t be difficult. What’s a list of 10 films/comics/novels/TV show that inspired Mists of Akuma? Jeez man, did you do a background check on me! Auugh! I’m just going to list these straight off the top of my head because, frankly, there’re so many. Check out the Mists of Akuma Kickstarter. Jane Lindskold and I first met at Gen Con about 20 years ago. The previous year, she had published her wonderful debut novel, Brother to Dragons, Companion to Owls, coincidentally the same year as I’d made my first short fiction sale. We also discovered we’re both tabletop roleplayers, and my one regret of that convention is that we never got a chance to play together. Jane and I exchanged letters and D&D books for a little while but eventually lost touch except for a brief greeting at a convention five or six years later. Since then, we’ve reverted, as so many have, to following each other on Twitter. This past spring, a remark by someone at Tor prompted me to ask whether they’d send Jane a copy of my latest Radovan & the Count novel. Soon after, we resumed our correspondence and she asked me a few questions for her delightful blog. Our exchange was so much fun that I had to ask to turn the tables and continue the conversation here. 1. As a pragmatist, I’m of the opinion that writers aren’t born but made (or self-made). They come to the craft from many different vectors, including formal education, writers’ groups, the guidance of a mentor, and a thousand other angles. What was your trajectory? For me, the launch pad to becoming a writer was telling stories—often based on my dreams—to my younger sister, with whom I shared a room until I was twelve. I also had a vivid daydream life, in which I would construct elaborate stories. And I’d play “pretend” with my youngest sister. I’m not really sure when I started letting the stories out of my head and onto paper. By college, definitely, but my sister says she’d find fragments back when we were younger. I certainly never finished these, nor did I take them very seriously. At this point, I had no ambition at all to be a writer. Freshman year in college I discovered RPGs. This was the year the AD&D hardcover guides came out, I believe. Gaming very much fueled my desire to actually write down stories. Often I’d construct an elaborate backstory for my character. These rarely were used, but I found myself stimulated by the process. Later, I’d write down portions of games—more or less unconnected fragments—but the attempt to put down on paper words that would convey to a reader something of the vivid sense of the characters and events from the game was there. I even tried an epic poem in rhymed couplets. At the same time, I was majoring in English, so I was reading a lot of wonderful material—or sometimes not so wonderful. Thinking about what stirred me and what didn’t helped shape me as writer as well, as did making friends who read SF/F and talking about books with them. Basically, those four years when I was earning my undergrad degree in English, I was also, all unknowing, doing a second “self-directed” degree in fiction writing. I did take one class, an elective, in short story writing. Honestly, the class didn’t teach me much that I hadn’t already figured out for myself, but it did force me to finish what I was working on. That—as I’m sure you know—is a huge step. I went directly from undergrad to grad school, but even though I was intensely focused on my studies, I didn’t give up either gaming or fiction writing. When I finished my dissertation, I decided to slot fiction writing into the space where the dissertation had lived. Above you mentioned “mentors.” If I had one, it was Roger Zelazny, who I met as I was finishing up my degree work. Roger read some of my early stuff and decided that I was already writing at a professional level. So, although we talked about writing a lot, he went out of his way to avoid making me, as he put it “into a cut-rate Roger Zelazny.” He never edited my stories or made more than the most indirect suggestions. Instead, he taught me about markets and various business aspects. Of course, I couldn’t have been as close to him as I was without learning a lot—I have a file drawer filled with his letters to me—but he never was in the least directive. After grad school, I started teaching college English and writing fiction (and non-fiction) on the side. Eventually, I sold a short story or two… And even later, a novel (Brother to Dragons, Companion to Owls). Twenty-four or so novels and seventy some short stories down the pike, I’m still at it. 2. I think you’ve both collaborated on fiction and finished someone else’s work, one of the things we have in common. How do those experiences compare with each other and with writing alone? I’ve done collaborations with a couple of writers—two novels with David Weber (Fire Season and Treecat Wars) and a short story (“Servant of Death”) with Fred Saberhagen. And Roger asked me to finish the two novels he was working on if he didn’t “make it” (as he didn’t). These were Donnerjack and Lord Demon. I’ve also written stories set in other people’s “universes,” which—if you’re respectful of the source material—is a sort of indirect collaboration. Each of the experiences was very different. “Servant of Death” was set in Fred’s “Berserker” universe, so he contributed the foundation. We talked over the story and I wrote the first draft. Fred then made some suggestions that he felt would draw the story closer to the “feel” of the universe. Working with David Weber was very different. Since the novels were prequels to the Honor Harrington stories—set hundreds of years earlier—there was a lot of new material to come up with. Weber and I are good buddies, and he gave me a lot of room to play, as long as we didn’t violate anything he’d already established. One area he hadn’t done a lot with was treecat culture, since most of the treecats in the Honor Harrington novels are not exactly stay-at-homes. I came up with a long list of questions. If he didn’t have an answer, he gave me leave to come up with my own solutions. Finishing Roger’s novels was completely different, since he wasn’t there to talk with. However, we had talked a lot about what he intended for both. He didn’t outline, so I had to go with what we’d talked about and what he’d already written. Earlier, I said he didn’t try to teach me how to write, but I feel that rising to the challenge of finishing novels by one of the greatest SF/F prose stylists of all time taught me an amazing amount. 3. More and more writers are open about being gamers, but you’ve never been shy about talking gaming. Is there still a danger of being “tainted” by association? And are there hidden or surprising benefits to gaming as a writer? The other day, I realized that by my next birthday, I will have been gaming for two-thirds of my life… And it hasn’t been a casual hobby either. Except for a few breaks when moving between locations (and thus between groups) I’ve gamed the whole time. Right now I have a group that meets almost weekly, and I really look forward to Sunday evenings for that reason. My first non-academic publications were gaming-related: two gaming scenarios for Call of Cthulu, published in Challenge Magazine. The second of these was badly messed-up in production, so I fear that any who tried to play it would have failed their Sanity roll at the outset. I think that the danger of being negatively stigmatized for being a gamer is greatly reduced these days. I mean, when people realize that Hugo and Nebula award-winners like George R.R. Martin and Walter Jon Williams are gamers, it becomes really tough to justify equating gaming and poor writing. 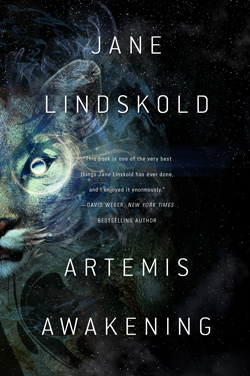 Projects like the long-running Wild Card anthologies, and James S.A. Corey’s “Expanse” novels have their roots in games played by or designed by the authors. Neither of these are “game-related” but gaming had a positive influence on their development. I think the benefits are myriad, especially for those of us who run games as well as just playing. When people ask me in what way a game is like a story, I explain that the Referee provides the setting—because even in those games set in an established gaming “world,” still the Ref is the one through whom the players “see” the setting. The Ref also provides most of the characters in the form of NPCs. The players provide the main characters. The Referee provides the start for the plot but—in a good game—the story’s plot is a result of collaboration between the Ref and the players. 4. What are some lessons writers can take from roleplaying games in handling magic and the supernatural? And/or what are some lessons one must never take from gaming? Magic and the supernatural are a bit separate in my mind, so I’ll deal with them that way. Despite reviewers who seem to frown at such, traditional magic is more often than not tied to a system of some sort. I wrote a long piece about this called “System = Unmagical” for Tor.com, that I revised for my own blog in March 2013 and included in my book Wanderings on Writing, so I’ll spare you why the “numinous” magics so beloved of critics are actually less “realistic” than magic systems that use spell components, gestures, and the like. That said, a writer can’t simply tag a spell by its game name and leave it at that. One thing I’ve found amusing when reading Pathfinder novels is how often I can tell precisely what spell is being described—and I haven’t played any version of D&D for over twenty years! A creative description of a spell effect is great, but just saying “Chromatic Orb” or “Spider Climb” is pretty clumsy. The supernatural is another thing entirely. Gaming universes often mix up elements that came originally from numerous sources—fictional, legendary, mythological, historical, even movies and TV—with no attempt to justify why, say, a creature from continental India would be in the same area as European-style werewolves. In the gaming context, that’s fine, because that’s the fabric of the universe. However, when writing fiction not set in that sort of universe, a writer must be careful to understand where various supernatural elements originated. A Norse elf and an Irish elf have element in common, but they are different creatures—despite the contact between the cultures. The same is true of a host of other creatures. The same story that might delight a gaming audience can seem a ludicrous mishmash in another context—and consequently subject to rejection from non-gaming publishing houses. 5. You and I, and a great many other writers, have an obvious affinity for wolves. What is it about those animals that remains so romantic in our imaginations? I can’t speak for anyone else, but I apparently imprinted on wolves at a very young age. One of my favorite imaginary characters had a wolf companion. When I’d speak about my enthusiasm for wolves, I was always told “Oh, you wouldn’t like real wolves,” but, in fact, I do. This doesn’t mean I don’t acknowledge that wolves can be dangerous. I try to get out the word that wolves are not meant to be house pets. 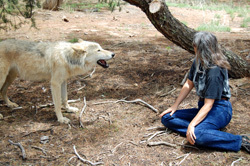 I do what I can to support the mission of Wild Spirit Wolf Sanctuary here in New Mexico, which provides homes for wolves and wolf-hybrids who have been unfortunate enough to be victims to humans on a power trip. Wolves are not monsters—not werewolves or Pathfinder’s “winter wolves” or anything of the sort. However, they’re not Firekeeper’s “Royal Wolves” either. They’re creatures who deserve to be respected for what they are. Watch for Jane’s latest at her website.